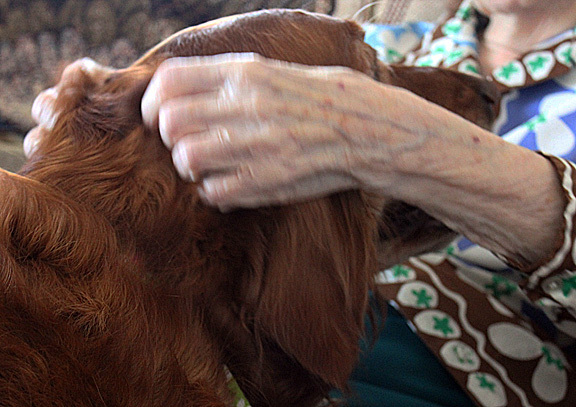 I brought Emmy, the dog, and she was the hit of the Assisted Living unit, where my Mom lives. So many residents wanted a chance to give Emmy the wubbies. Em loves nothing better than being petted for hours. I think I will try to get Em to be a certified therapy dog. It involves a test I think we can pass. She is a natural. She could, then, get credentials and go anyplace, not to mention having a photo ID and a snappy royal blue dog vest. 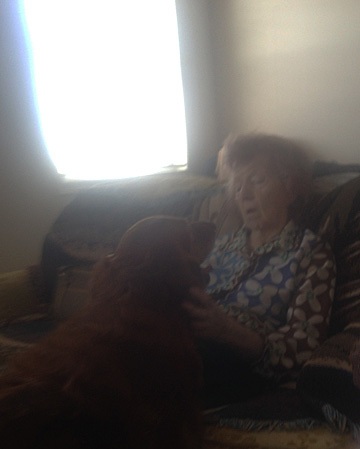 I should mention that my Mom, age 96, does not like dogs. Emmy's attitude of "I really really love you" won Mom over. Here is a shot from my Iphone , which I am gradually learning to use. And another shot using my Canon. I rescued Em from our local shelter about 3 years ago. I was very weird and sick with hyperthyroid disorders which have since been remedied. Secretly, I named her Em as a short for Empath, which she does very well. But even dogs get very tired when they give all the love they have for 3 days. It was raining and thunder storming all 500 miles for the trip home. And we made it in one day. Just to be home.